Fully assembled, ready to use, Durso Standpipe for 1 inch bulkhead. 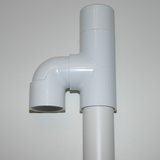 This product uses 1.25 Inch Schedule 26 PVC pipe and Schedule 40 fittings. One inch bulkheads are rated for 600 GPH.